Come elevate your soul and attune the body-mind via the ancient science, art and technology of Kundalini Yoga as taught by Yogi Bhajan in a cozy sanctuary/oasis in Hollywood. Steps into Space Yoga chooses kriyas and meditations in alignment with the planetary energies and cycles of the moon to support your conscious expansion in union with the Universe. Kundalini Yoga and meditation is a practice that balances the glandular system, strengthens the nervous system and enables us to harness the energy of the mind and emotions so as to still the commotion of our thoughts and feelings. * * * A kriya is a series of exercises or postures (asanas) combined with breath (pranayama), hand and finger gestures (mudra), eye-focus, chanting (mantra), and body locks (bhandas) in a precise, conscious manner that affects the body, mind and soul. The total impact is greater than the sum of the parts. * * * Kundalini means awareness. 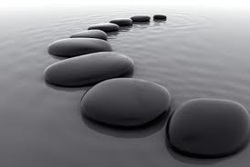 Awareness is the active interaction of you as a finite individual identy with you as an infinite potential identity. 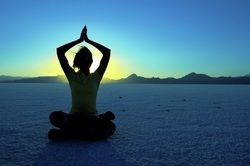 Kundalini Yoga is the supreme technology to awaken that awareness and take you into your original Self. The technology of Kundalini Yoga as taught by Yogi Bhajan® is a science of the mind and body, to elevate the spirit, which has no boundaries, no discrimination. Therefore it is for everyone, universal and nondenominational. "Sensible, radiant and graceful are the three stages for a woman. She must be looked upon and judged as a very sensible woman. That is the only protection that she has. Then she must be radiant, her personality must be a bright light. The third stage is being graceful. Once a woman creates a sensitivity about her that she is graceful, there's nothing on the planet that can touch her." The moon at high tide is strong. The moon at low tide is weak. As the Moon waxes from New to Full, the increased light is appropriate for initiating new projects and ideas for growth. The waning Moon, moving from Full to the next New Moon is a time of spontaneous and instinctual action appropriate for conscious clarification of values. The 29.5 day moon cycle is called the synodic period. 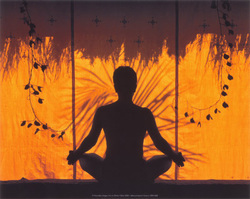 ** Sadhana is your daily spriritual practice, preferably in the amrit hours before the sun rises.